One of the biggest challenges in using postcards for direct mail marketing is stopping power. Your postcards have to “stop” and capture a person’s attention long enough that they read, understand and respond to your message. Otherwise, your piece of direct mail will be ignored and thrown into the trash with the rest of the junk mail. There are three important ingredients that can help you to maximize the return on your direct mail investment - relevance, singularity, and simplicity. Relevance means relating to the matter at hand. In this case, postcards should “relate” to your target audience. Knowing who your audience is and what they want or need and then communicating to them with that knowledge is your goal. Today’s technology has made mailing lists very simple to compile and extremely effective. Mailing lists can be “customized” to meet the criteria of your target market. With this type of specificity available for your marketing campaign, relevance can be easily achieved. Singularity is the second important ingredient. A postcard should focus on one, “single” idea, service, product or event. More than one of either of these elements, and you run the risk of diluting your message and confusing the reader. The most effective marketing postcards are simple and have a singular focus or objective. So simple that the reader will understand instantly what the card is all about and the message you’re trying to convey. There’s very little space on a postcard so keep your messages short and to the point. There are two sides to a postcard – a billboard side and a message side. The billboard side should be light on copy but heavy on message. It should include an attention-grabbing headline, eye-popping graphics and brief relevant information that will give the postcard immediate value. The message side or back of the postcard should continue where the billboard side or front leaves off. It should give more details and instruct the reader what to do next. It should also offer an incentive or some type of reward to the reader for the action taken. 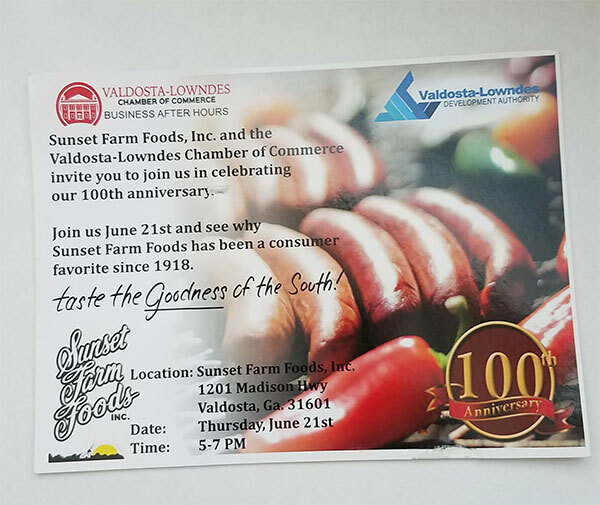 This is a direct mail postcard for an event Sunset Farm Foods and the local Chamber Of Commerce held. This marketing piece grabs your attention and tells you exactly what its all about. The postcard size will vary based on your needs. If you have any questions with ordering, feel free to reach out to us. We're here to help.